I thought that MSG was something only found in Chinese food, but apparently it’s found all throughout processed food products including those that are gluten free. This reality floored me because I honestly didn’t know very much about MSG other than it can make you feel awful if you’re sensitive to it and that it’s best to avoid. Turns out that few people have realize that MSG is present in their “healthy” food products, and once you’ve pinpointed the problem spots, removing MSG from your diet can provide massive health benefits. If you’ve felt better after removing gluten (and casein) from your diet, listen up because there’s a connection to MSG that I never understood before now and I just had to share this with you! My guest on today’s podcast is a brilliant woman who has transformed the health of her daughter (and herself) by removing MSG. Through researching the effects of MSG, she found learned of MSG’s ability to exacerbate autoimmune conditions and much more. This podcast is not just something to check out for yourself — it’s a must share regardless of whether your friends and family are gluten-free. Jennifer: Welcome back to the Gluten Free School Podcast. I’m your host, Jennifer Fugo. And today, we’re going to talk about a topic we have not touched on before, specifically MSG. Many of us know about it, we’ve maybe heard of it, maybe you believe that it’s really not good for you. But I found a woman who is not only absolutely brilliant, but she is going to explain to all of us why we need to be so concerned about MSG and how it can cause major problems for our health – not just for us, but also for our kids. And maybe if you’ve got grandkids, them too. So this is great information, not only to take them for yourself, but also to share. 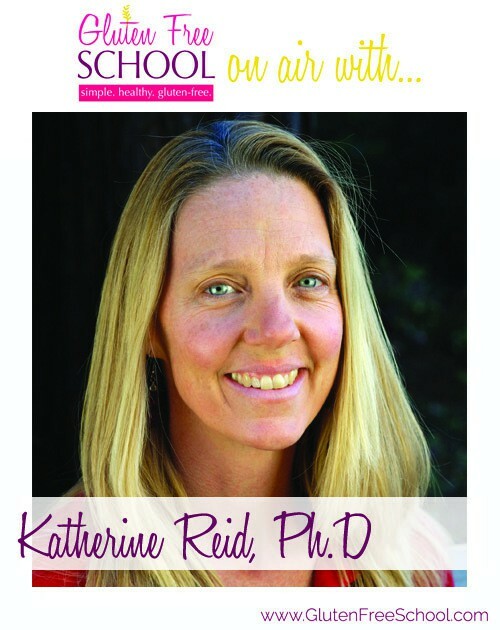 Katherine Reid, PhD is the executive director and founder of Unblind My Mind, a non-profit that educates on the links between the food we eat and the chronic illnesses we suffer. Katherine has a PhD in biochemistry with over 20 year experience in biotechnology and molecular diagnostics, training that would find her ideally suited to tackle her most challenging scientific endeavor. In 2006, she became aware that her youngest child had autism. Through her research, Katherine determined that certain foods common in the western diet were associated with her daughter’s autistic behaviors. Seeing the profound effect of diet on the brain, with many of her clients she’s become a provocateur, questioning medical approaches and food manufacturing practices related to health. Katherine provides the missing link that many search for in managing or restoring health through diet. Recently, Katherine has presented two TEDx talks, spoke at Curando El Autismo Conference in Puerto Rico, Transform Your Health Summit, and has provided local lectures at schools, local functions and the Unblind My Mind organized conference. She’s been featured in the San Francisco Chronicle, Fox News and New York Daily News along with various radio shows, blogs and podcast. Her website is UnblindMyMind.org. Dr. Reid, welcome to the podcast. Katherine: Thank you for having me and thank you for the introduction. Jennifer: You’re welcome! I watched your TEDx talk. That’s how I tracked you down and invited you to be here. And actually, believe it or not, it was one of the podcast listeners that sent me an email suggesting I watch your TEDx talk. Why don’t you share with everyone a little bit about your journey on why MSG became such a big deal to you. Katherine: Yes, yes. Like your introduction, I really didn’t focus on the food and associations to health really until my youngest child was diagnosed with autism. The scientist in me started researching brain chemistry, neurological chemistry, immunological activation, inflammation, and really wanting to understand the mechanisms that can either benefit or be deleterious to these big systems. I started focusing more and more on diet and thinking, “Well, is she getting enough nutrients for optimal brain function?” But there wasn’t a lot of scientific research on the dietary studies in autism and so, I just started on taking this journey. But I found a lot of parents, parenting children with autism, saying that they saw some improvements with the gluten free, casein free diet. Gluten free is obviously very familiar with your audience, and then casein is the protein found in milks. And while people weren’t claiming they cured their child, it was clear that the majority were seeing some improvements. And so I went down that road of removing all the gluten and casein products in the diet. I also went on this journey with my daughter so that she would feel that there was company, she wasn’t isolated. And because she’s the youngest of five children, I couldn’t get all the kids to participate, so at this point it was just her and me that were on this food journey. I did see improvements in her behavior. While she is still considered autistic, I became really curious what’s the connection between gluten and casein that so many are starting to see improvements. I started to dive – and this is my scientific background – really looking at the proteins of gluten and casein. I discovered that the amino acid (that’s the building blocks of proteins), the majority is glutamate, which is an amino acid found in all proteins. But in gluten and casein it comprises over 25% of the protein, which is unusually high. Typically, it’s about 5% to 10% glutamate amino acid in a protein. When I started to really dive in to the food manufacturing processes, I realized that there is an entire science behind trying to enrich these gluten/casein food for free glutamate. That means it’s breaking apart the protein peptide bonds and creating free glutamate, which we know in our foods as monosodium glutamate or MSG. A light bulb went off like, “Wow! I wonder if the removal of gluten and casein is more about reducing the MSG load, and that’s why people are seeing some improvements.” But because those aren’t the only source of MSG in the diet, people were just seeing improvements rather than more drastic reduction in symptoms. And so I started to scientifically search this literature about whether or not there was an association between autism and MSG or glutamate. And I honestly felt like I hit the mother lode. And we were not just talking about autism, but there are all sorts of chronic inflammation, chronic immune activation such as autoimmune diseases, late onset disease like Alzheimer’s and Parkinson’s. Even diabetes is now linked to glutamate and MSG consumption. Not only is this possible, we have what’s called a glutamatergic dysregulation epidemic, meaning that the population is demonstrating the inability to regulate glutamate at balanced levels and it’s an epidemic in modern population. And so like I said, from Alzheimer’s to early onset diseases like autoimmune diseases, ADHD, autism, a lot of mood disorders can be more early onset. And again I went on this experiment with her. Now, at first I received strong protests from my husband because I was about to remove all comfort foods from the house. Katherine: And honestly, this went way beyond my scientist degree! I had to become a detective because I realized that our food labels are extremely inadequate with providing the consumer enough information to determine what contains free glutamate. And so you really have to go one step removed and actually look at how is the food processed to make that ingredient that then goes in the food. The behavioral dysfunction was causing a family crisis. It was really challenging to figure out how to manage behaviors. All of those went away and she is now the most social child out of the entire family. She no longer requires any assistance for learning. She’s in mainstream second grade right now and doing great health wise. And myself, I got rid of 40 years of pollen allergies that I suffered with for years. Two months out of every single year, it seemed like I was just sick. I just constantly had headaches and runny nose, all from these pollen allergies, and that completely went away. Jennifer: Wow! So it makes sense that that whole cleaning out process would have these amazing effects that people feel in a sense of waking up from a fog. Katherine: Exactly, and obviously, with the engineering of food, the additives are much more than just the enriched sources of free glutamate. But what I do think is that these engineered foods are absolutely increasing inflammation and MSG. Glutamate is absolutely associated with activating the immune response and activating inflammation. And so when I started to look at the pathways of what was going on with excess glutamate I I began to understand the underlying mechanisms of why did I see such improvements with such a wide variety of different conditions. But the Paleo and the GAPS and the Atkins, all of these transitions in diets, and even gluten and casein free or gluten-free, you’re removing significant sources of MSG. When you say gluten-free, you’re moving towards whole foods. I’m also seeing a gluten-free diet where you can start going to more processed gluten-free options and what they’ve done is they’ve enriched for free glutamate to make it taste good because guess how they used to make MSG before they found cheaper ways? They used to take gluten and hydrolyze it or break apart that protein to free the glutamate. That’s how it used to be manufactured. So, they just now add it to these gluten-free products so that people are still getting addicted to these products. Katherine: No, no. And that’s the whole purpose of why I started Unblind My Mind, it’s because it really is not widely known that all of these ingredients are really enriching for free glutamate. In fact, MSG is probably labeled one percent of the time, and less than that I would say, when the food actually contains it. And it’s because food manufacturers are not required to out the final amount of products. So, if you take a protein, for example, and you put it through extensive fermentation practices where they selected the fermentation conditions to enrich for free glutamate – and that’s exactly what they’re doing – they’re not required to label the byproducts of that fermentation. All they need to do is label protein. So when I’m talking to people and raising awareness, it’s not only about the education, it really is almost like helping them wean off the addiction and opening up their palates to real whole foods, nutrient-rich foods so they can start to restore health. Jennifer: So how can someone even begin to find MSG if you’re saying it’s not labeled and they’re not really required – are they not required to label MSG on foods? Jennifer: Wow! So then I guess the question is how do we even begin to look for this because from what you’re saying, it sounds that food companies are hoping that we don’t recognize what it is that we’re eating? All these advocates for, “I don’t need MSG,” – I always think MSG, I think Chinese food. Jennifer: I do! Many of us have heard that thing. You go to the Chinese restaurant and say, “Oh, is your food MSG free.” I think a lot of restaurant had gotten better about it, because there’s been that outcry of not wanting to consume it. But here, what you’re saying is that food manufacturers got smart and started to hide it. Katherine: Yeah, not only did they get smart, they have become incredibly powerful. So when I recently watched the documentary Fed Up, which is all about the sugar industry and how much the food industry really is powerful, that same message could have been written about the glutamate industry. The International Technical Glutamate Community was formed right after they’re starting to begin research about the association of MSG and brain lesions. And this International Technical Glutamate Community started to receive money from food industries that have a vested interest in keeping the food additives in their foods. And now that industry – I mean, it’s a trillion dollar industry. It had over 50 different committees formed under this, what they call ‘consulting company’ that’s actually was owned by Monsanto. And so there are 50 different committees under there. Each of these committees send a representative to the World Health Organization Codex that establishes the standards of what’s considered a safe additive and the labeling practices required. There’s not an equal representation of the public interest there at all. And so not only have they gotten smart about labeling the foods, they have really become influential and powerful about how to keep it that way. Jennifer: What are we going to start looking for? I mean, all the women that are listening to this (and the men too, the wonderful guys that listen in as well), what should we start to look for in gluten-free foods that we might not suspect is really MSG, but would be? Katherine: Yeah, and one of my hypothesis starting out initially was that the wide range of benefits the people were seeing in the autism population with going gluten-free and casein free was what they were replacing those foods with. If they’re replacing them with whole foods like vegetables and fruits and nuts and seeds and such, the improvement was slightly better than if they were replacing it with processed foods. Where you start to get into a lot of challenge is when you have to read labels of prepackaged foods. I have a list on my website that contains all of the ingredients or list of ingredients that contain free glutamate. Jennifer: You do it! And I will tell you, it’s a really great list and everybody should go get this. It is a really great list. I’m looking at it now. If you go to UnblindMyMind.org and scroll down a little bit, Dr. Reid has a link to that list and also, her sign up box. So definitely make sure to sign up for her newsletter. But this is a great list! Fermented soy, the reason why it tastes so good in our palate is it has free glutamate. It’s a fermented soy product. Even vegans, when they think they’re being so healthy, they’ve got all these processed soy products like tofu and tempeh and fermented soy sauce in their diet that are really high in MSG. And so, it’s amazing when people say, “Gosh! I thought I was being so healthy,” and certainly I started out that way too, thinking I was being so healthy until I unblinded my mind. Jennifer: I’m curious. You have reduced fat milk, skimmed one percent and two percent on your list. And I personally cannot stand milk. It is revolting to me. I’m sorry to all you milk lovers out there, but I don’t understand how people continue to drink it once you know what it is and how processed it is and such. But how exactly did that end up on your list of things with MSG? Katherine: Like I said, the casein protein has 30% glutamate as part of its protein structure. Raw milk is fine and has very low levels of free glutamate. That low level of free glutamate serves to signal, neurologically signal the body to prepare for protein coming down the digestive tract and the brain receives signals to expect protein, which is a required nutrient and energy source in our body. Jennifer: It’s usually the hardest thing for vegans to give up. Now, another two that are on your list – and I just want to ask because I have written articles about them on my website and I have asked another podcast guest, Melanie Warner. I had her on last year actually. She talked about food scientists and what they do and how they make up foods from powders and all sorts of weird things and engineering food. It was so strange. We talked a little bit about xanthan gum and carrageenan. So is it pretty much a guarantee, if we see either of those two, which tend to being gluten products, if you see either of those two should you think, “Uh-oh, this product probably has MSG in it.”? Katherine: Yeah, the xanthan gum is funny because I have received a couple of emails from food manufacturers saying, “Where is the evidence that xanthan gum contains free glutamate?” And so, I sent them a 37-page manufacturing protocol on xanthan gum where they were adding glutamate to the fermentation feed for the nitrogen source of the bacteria cultures that were being used. When you look at the final nitrogen content, the only nitrogen source was glutamate. And so all of that nitrogen is equal to that glutamate content in that food. So while it may be one to two percent of xanthan gum and the xanthan gum itself is only added one to two percent, what happens is it’s developed a total load in your diet. So, if you had one single cheat food that had xanthan gum in it, it likely wouldn’t cause too much of an issue if you’re not that sensitive, but if you’ve got – citric acid is another one on the list. Citric acid and xanthan gum are pretty pervasive across the medicines and beverages, and foods that the total load starts to add up until the small amounts in each particular food just creates a high MSG load. But like I said, the biggest offenders are definitely the processed proteins. Jennifer: My audience for sure is really interested in supplements and herbs. So for you to mention that there can be MSG in supplements I think is probably going to shock everyone. Katherine: Yeah, particularly foods that say “enriched with vitamin D.” That’s a red flag because they are not required to label where they got their vitamins. They’re probably supplementing it or enriching it with the cheapest source and it’s bound to be containing free glutamate. Katherine: Oh, absolutely! In fact, I definitely probably have spent the last year and a half on microflora metabolism and exactly how their metabolism changes with respect to environment, the foods we’re feeding them, so absolutely. You can actually have an overgrowth of a particular species and supplements could actually be feeding that microflora to more overgrowth. But the whole glutamate story with the micro flora is actually fascinating. The microflora are adaptive. And so whatever the environment is in your gut, the microflora going to adapt to that environment. And if you have a bunch of engineered processed foods that have simple sugars and simple amino acids widely available for them to consume in their metabolism, they will. And they have the ability to keep you addicted to those foods because they can release signals to our neurological system that keeps us feeding that addiction. So they contribute to addictions too. Jennifer: And what I was going to say then, because this sounds like anyone, in a sense, can be sensitive to MSG then. It just would vary to what degree? Am I wrong in that assumption or headed in the right direction? People don’t understand how widely variable – because like I said, over 50% of our neurological system is stimulated by glutamate. We need glutamate in our system to help regulate signaling between our neurological system, our immunological system and metabolic function. But when you exacerbate it by adding a lot of external glutamate, you’re actually sending a stress signal that further helps cascade the inflammation or stress signal throughout the body. Jennifer: Wow! This is wild. Well, you know what? I want to leave everybody with something positive because I think they’re going to walk away from this going, “My head’s going to explode, I don’t know what to do,” I think the first thing to focus on here is to eat real food, that is number one. And number two, depending on where you are on your journey, being gluten-free. If you are still eating products, I think it would behoove you – not to continue to push you guys to get this list, but I would highly recommend to go to UnblindMyMind.org, get her list and look all at the information that Dr. Reid has compiled. As I was looking at it even, I was like, “Oh, wow! Yes, I’ve seen that on food. I’ve seen that.” So it is very helpful. Katherine: Yeah, I think the realization that it just isn’t worth the time to try to decipher all these ingredient labels because their manufacturing processes are obscure. I would email the food manufacturers and ask them, “You’ve got natural flavors in there. Can you please let me know whether there is free glutamate in there or what exactly is in there?” Often, I would get a response that “it is proprietary.” And like you said, there is nothing proprietary about what goes in our body. If they’re not willing to reveal it, I think we need to absolutely act. But I found that the more that I just went to whole foods, it wasn’t so time consuming. It really is about establishing a routine, making fresh foods out of whole food ingredients and really starting to appreciate the taste of real whole foods. And it isn’t much more time. I think that’s a myth where people think, “Oh, I just don’t have the time.” Honestly, some of my easiest meals, when I pack my daughters snack, it’s like cashews, carrots, sliced apples. And I can make it all raw foods and she loves it. And so that’s really easy. Jennifer: You also do consulting for people that are interested in getting some help around this for their families. Katherine: Yeah, we offer email support. People, as they go through their journey, honestly, I’ve had people shooting pictures from the grocery store saying, “what about this? what about this?”, just to help guide people into the transition because it may seem daunting at first. But like I said, once you’ve establish the habits and the routine, it actually is fairly easy to adapt to. It’s just daunting potentially at first. I also do consultations over Skype and/or with group settings or individuals just to help to guide people for the transitions. Jennifer: Well, I want to thank you so much for coming on the podcast and sharing all of these because wow! It’s a total eye-opener, its shocking. And in the same respect, by learning this information and being more cognizant of it in the food we choose to eat, we can then take back more power over our diets, over our health and what-not. Katherine: Yes, yes. Well, thank you for having me on the show and helping spread the message because I do I feel like we would all, as a population, would benefit with less health issues not just from the healthcare cost (that is a huge factor), but happy, healthy people are better to interact with. Jennifer: Absolutely, absolutely. I love that point. Everyone please go to UnblindMyMind.org. Please follow Dr. Reid. She is brilliant. I’ll definitely make sure I’ll post up both of her TEDx talks. I will make sure that there are links, so that you can share them and hopefully, we’ll inspire some other people in our lives to also see the value in caring about MSG and getting to know Dr. Reid’s work further as well so they can improve their health. Now, remember to subscribe, rate and review this podcast and head over to Gluten Free School. Leave your questions, your comments. 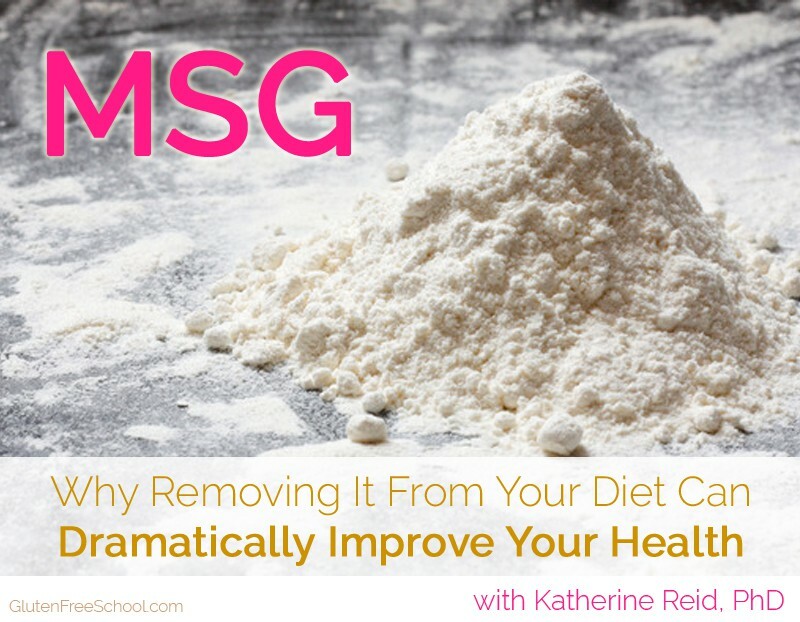 If you have a personal story or experience with MSG or removing it, we’d love to hear it. Leave those comments below. And please, as is the case with Dr. Reid, if you have a suggestion of someone else you feel has really got a great message to share, email us, let us know and we’ll reach out. Thank you, again, Dr. Reid. We really appreciate you coming on. We’ll see everybody coming soon. Take care! Thank you. This was a real eye opener!!! WOW!!! You’re very welcome, Cathyrn! I’m glad that I could share because even I was really shocked about this too! Wow! Who knew?? This was an amazing talk! Thank you so much for sharing! I was driving the whole time and it was the fastest trip ever. I was so engrossed in your conversation with Dr. Reid. Interestingly last night I had a fair amount of tofu…this morning was all groggy and had a serious case of brain fog, could not figure out why…until I listened to this podcast. It blew my mind! Thank you for bringing this important information to our attention!